Home Clinical and Disease SSRIs for Anxiety: The Wrong Prescription? Selective serotonin reuptake inhibitors (SSRIs) are the newest and most widely used class of antidepressants on the market today. Furthermore, they are prescribed for more than the treatment of depression. Individuals with bioplar disorder may also be placed on a regimen of SSRIs to augment their primary medication, or in the case of PTSD and anxiety, used as the main pharmaceutical treatment. However, the general application of SSRIs for anxiety and conditions other than depression should be in question, especially since current research is changing the way we understand them. 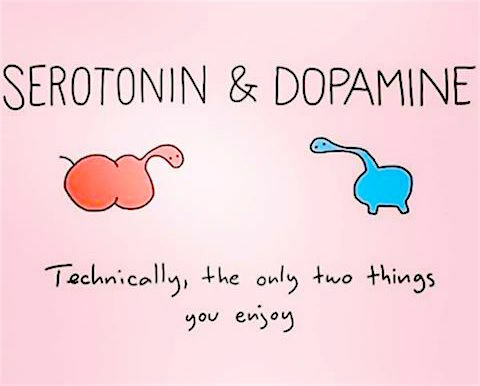 Serotonin is a neurotransmitter produced in the brain and gut, responsible for mood stabilization, feelings of calmness and general wellbeing. The scientific community still hasn’t reached a consensus on whether or not inadequate serotonin or serotonin receptor levels are the underlying causes for depression and anxiety, however, they have become the typical pharmacological treatment target for both disorders, even though they aren’t the same thing. It is a common misconception that SSRIs simply increase the amount of serotonin available and therefore mood is improved. The drugs actually work by binding to proteins called serotonin transporters (SERTs) in the brain, which are responsible for recycling “used” serotonin, carrying it back to the message-sending neuron to be used again. 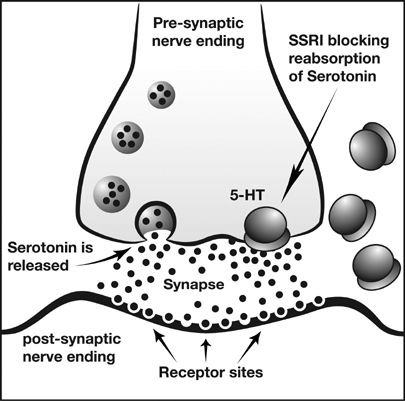 By blocking the function of SERTs, more serotonin remains available and “free-floating” in the space between neurons, allowing more to be used for neuron-to-neuron message delivery. (For more, check out this interesting article in Scientific American.) Currently, there are six SSRIs available on the market: Celexa (citalopram), Lexapro (escitalopram), Luvox (fluvoxamine), Paxil (paroxetine), Prozac (fluoxetine), and Zoloft (sertraline). 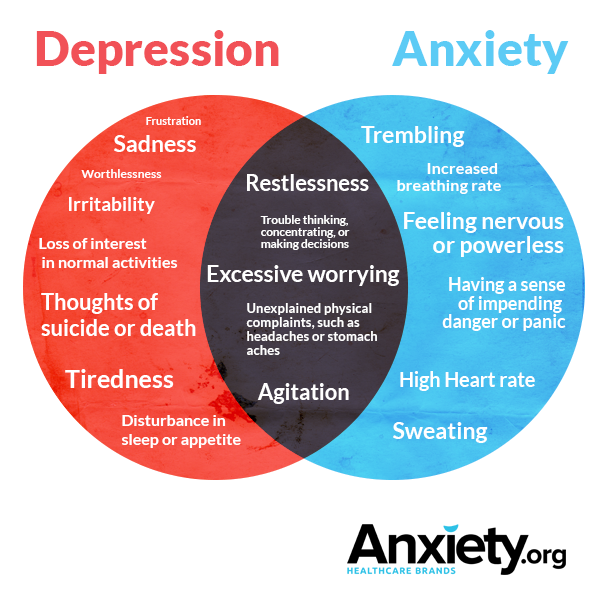 Depression and anxiety aren’t synonymous, yet we use the same medications to treat them. Might there be something wrong with this approach? Several studies in the late 90’s and early 2000’s used animal models to investigate the role of serotonin in anxiety, “knocking out” certain receptors in mice to see whether or not it affected their mood. Mice without the receptor 5HT1A, for example, exhibited fear-like behaviors and heightened anxiety. So, what is the cause of anxiety? Translate this into human conditions, and it could be assumed that we found the underlying cause physiological cause of anxiety disorders in people: low numbers of the 5HT1A serotonin receptor (although others may play a role), or low production of serotonin (not enough to bind to the receptor and cause the positive mood affects). Insert the application of of SSRIs. 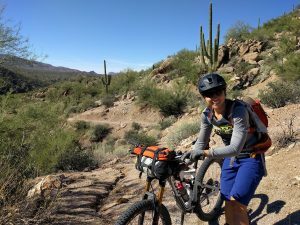 But now, some researchers believe this previous theory may be somewhat incorrect – that some anxiety disorders may be caused by too much serotonin, not too little. They compared the results to the same scans completed in a control group of individuals without the disorder. Their results, published in JAMA Psychiatry, show higher rates of serotonin synthesis in those with the anxiety disorder compared to those without it. Other studies are reaching the similar conclusions, debunking the widely accepted notion that anxiety, like depression, is due to low serotonin. Step back a moment and apply the all of the aforementioned information. It seems to make sense that using the same pharmaceutical treatment method (SSRIs) for two mood disorders with different sets of symptoms – disorders we don’t fully understand the physiological cause of – could be the wrong approach, and perhaps ineffective. Frick, A., Åhs, F., Engman, J., Alaie, I., Björkstrand, J., Frans, Ö., … & Lubberink, M. (2015). Serotonin synthesis and reuptake in social anxiety disorder: a positron emission tomography study. JAMA psychiatry, 72(8), 794-802. Ramboz, S., Oosting, R., Amara, D. A., Kung, H. F., Blier, P., Mendelsohn, M., … & Hen, R. (1998). Serotonin receptor 1A knockout: an animal model of anxiety-related disorder. Proceedings of the National Academy of Sciences, 95(24), 14476-14481.
antidepressants, anxiety, depression, exercise, mood, serotonin, ssri. Bookmark.